Some of you may know this, due to some hints dropped here and there on Twitter, but I am planning to dedicate the entire month of October to a celebration of Chicago authors and literature. Living in the Chicago area myself, I have been amazed over the last few years to realized just how many fantastic authors live in this area. I decided that I wanted to do something to support some of the wonderful authors that make the Chicago literary scene so rich. Bonus for all of you: Chicago authors write a variety of different genres, books of interest to more than just Chicagoans. So even if you have absolutely zero interest in Chicago, you should be able to find lots and lots of books you are interested in. Those of you in the Chicagoland area, be on the lookout for the announcement of a special event at the end of the month! So how can you help, besides coming back in October and checking out all of the Chicago authors I’ll be featuring? Easy, let me know who your favorite Chicago authors are! I have quite a list already, but I will make sure to mention all published Chicago authors whose names I’m given, whether or not I have a chance to feature their work. Whether you are a reader, publicist, or author, go ahead and leave your suggestions in the Google Form below. If you have more than two suggestions, I will have to ask you to submit the form again. Thanks! This is such a unique challenge (and I totally dig the song!). I would love to participate but plan on spending all of October reading spooky stories to get into the Halloween spirit. Perhaps there are some scary books written by Chicagoans? Edward Gorey was born in Rogers Park. Not spooky so much as macabre, but I still read lots of his stuff around Halloween. Edward Gorey’s Haunted Looking Glass is a compilation of some of his favorite lesser-known stories by authors like Bram Stoker, Charles Dickens, Algernon Blackwood, etc. If you can track down a copy it’s a great Halloween read. Definitely puts you in the spirit. She runs ghost tours and we took one around Halloween a couple of years ago. It was great. Being a fan of reading books about my hometown (Boston), I think you’ll have a hoot reading all about Chicago by Chicagoans! I’ll try to read along, too — Chicago is on my list of cities I’d like to live in someday. Sounds like a really great event! Great button, great song, and great idea. Best of luck with it all. What a wonderful event! I lived in Chicago proper for about 5 years, and I’ve spent the rest of my life before and after about an hour south of the city. It’s a wonderful place with many great authors. I can’t wait to see who you feature! This is a great idea – I’ll be watching for your reviews. Chicago is one of my favorite cities (we are coming up on our annual trip at the end of the month!). Right now I am actually reading a Sara Paretsky novel – her V.I. Warshawski series – that takes place in Chicago. But my favorite Chicago book ever? Devil in the White City. This sounds like a wonderful idea! I can’t wait to see some of the authors featured. I mentioned 2 authors all-ready and I’m going to have to try and think of a couple more. Sara Paretsky, comes to mind! What a fantastic idea! I have been pondering, in the last several months, about Chicago authors. I would love to read books specifically by local authors but I have not figured out how to locate them. I am looking forward to seeing who is on your list. I think I would love to play along on this one, if you don’t mind. By the way, if you have a tip on how to locate Chicago authors, please let me know. Thanks. I don’t have much in the way of tips, but I will be publishing a list of all the authors I get. I’ve also heard that looking into the Printers Row schedule can be a good way to start. 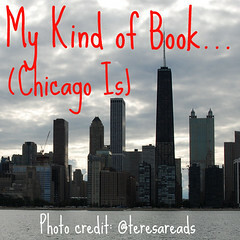 I love reading books set in Chicago, and I’ve got bunches of recommendations for that, but I don’t usually pay a whole lot of attention to where authors are actually from, so I’ll be interested to see the final list! You are SO SMART! You’d think I would have thought of this already, since I just suggested CK to someone else for something similar, but I totally didn’t. Thanks! Totally saw this post too late (I could have suggested many faves), but as a Windy City suburbanite, I look forward to reading all your posts and hearing what local flair you highlight! Love the song too, BTW! Except now it’s sort of stuck in my head….